wow, it is amazingly mild tonight with little wind too. The fields have dried up of their mud and the horses feet are completely dry coming in. Signs of spring are definitely here. Tonight North East Riding Club worked together with Findon Riding Club to offer another Flatwork lesson at Fountain Equestrian. Tonight Jean Stephen was teaching and I took Spangle along. She was a little on her toes to start but knuckled down and gave really pleasing work. “Humphrey Walters is at the forefront of leadership and management development. As a successful CEO (for 35 years) he knows what it is like to be at the very top and stay there. He is a prolific writer authoring a number of books examining human and organisational performance. He also works at the very top levels of international sport across a variety of disciplines. This body of work led Humphrey to research the essential winning behaviours required to succeed at senior international level sport. He has successfully applied the winning behaviours in the business world with the concept of ‘The Business of Winning’. During this talk Humphrey will share his considerable insight and experience around building and leading winning teams using the backdrop of the England Rugby world cup winning side, Premier League football, Formula One motor racing and the Olympics. Humphrey makes sense of the lessons to be learned from sport to enable business success.” and thought I most certainly was. Nicki also said I could forward to others that may be interested so last night a colleague and myself went along to an event organised by the University of Aberdeen Executive Education Partnership where Humphrey Walters gave a presentation titled “Winning in a tough environment/ Winning Leadership – it’s a game of inches – 100 things 1% better”. I came away smiling, with plenty of food for thought – both from a personal perspective in competing in endurance but also from a personal point of view for career development and for interview preparation, and from a professional point of view in the work environment. They are constantly looking for little changes to make that could just give them the edge (I can relate to this – I find a huge part of endurance is constant trouble shooting, making minute alterations just to make things a little bit better – then all those little things collectively add up to a big improvement over time). Start with the end result you want and work backwards, talking in past tense about what you would have done to get there – look at the list – can you do those things individually? Fight for success – why can’t it be you? Handling Issues – give issues numbers – 1&2 you don’t need to know – I’ll fix it (Francis/Catriona/Mum & Dad did this very thing in Exmoor in 1999 and Carola and Joan did at Burgie in 2010 – both car incidents – there was no need for me to know what was going on – they had it under control); 3 – You need to know but this is what I am going to do; 4 – I need to tell you and this is what I propose to do. ; 5 – I need your help as I don’t know what to do. By giving numbers and them being allocated it also allows clearer communication on emails etc as to the importance of it. “We are going to make it!” – concentrate on what you can control; look after each other; Never ever take the eye off the ocean; Focus on what is possible – look for the gap in the wave. It is serious up on top but fun down below – be serious when it is needed and have fun at the other times – this is required for success! These talks are so inspiring; some it makes me realise more about myself – perhaps why some things have worked out for me, why I see the detail in work matters that I want to improve but that others may miss or deem of less importance, why I constantly look for little things in many manners of life to be changing and altering. So for me I find these not only of interest to take on board, but as a way of understanding myself and why I perhaps operate how I do, why I do things differently and why I need to accept that is a good thing! I feel very humbled to have started my year with two amazing inspiring talks by World Class Performance Managers. Thank you Nicki for inviting me along – I have a good feeling that great things may come as a result of this (and not only in Endurance/Sporting terms) – watch this space! Marco, at 19 years old leads a slightly easier life nowadays and although still in regular work he is the one who gets the days off when time is short. This week we have two indoor flatwork opportunities at Fountain Equestrian, one through Findon Riding Club and one joint between North East Riding Club and Findon. I organise the Findon North Training nights that are run from Fountain and partake in the flatwork sessions. As we have two opportunities this week I thought that Marco should get to one of the evening sessions – and what a great session we had. Sue Hendry stood in to coach 9 horses and riders at last minute after illness hit Niamh Meehan (Get well soon Niamh). Sue has a great coaching style and we had a super time – Marco is feeling as good as ever and he will likely be out at some Riding Club Dressage soon – watch this space 😉 I think he rather enjoyed his outing tonight – his ears were pricked and he was jolly and he showed a bit of cheek occasionally. He is a clever lad and knows exactly how to work well – but equally knows how to avoid it given the opportunity! He does make smile though – and that I feel is one critical thing we should all remember with our horses – we have them to enjoy!! Last Saturday (28/02/15) saw us head to the beach, with Dawn and our Floss, fellow liveries. Floss was very excited on arrival at the parking and the km walk onto the beach, Spangle was remarkably sensible and being very good – until we hit the beach – then she decided it was pointless going up the beach to turn and come back – we have a fabulous stretch of beach but this is the downside of it. On the plus side I led her 2km up the beach and back so she didn’t not go at all, so I had a fab 4km sand walking workout. We shall be visiting the beach more often to overcome this difference of opinions. Floss still got a workout and went ahead and had a play alone. I think she may be feeling the joys of spring. 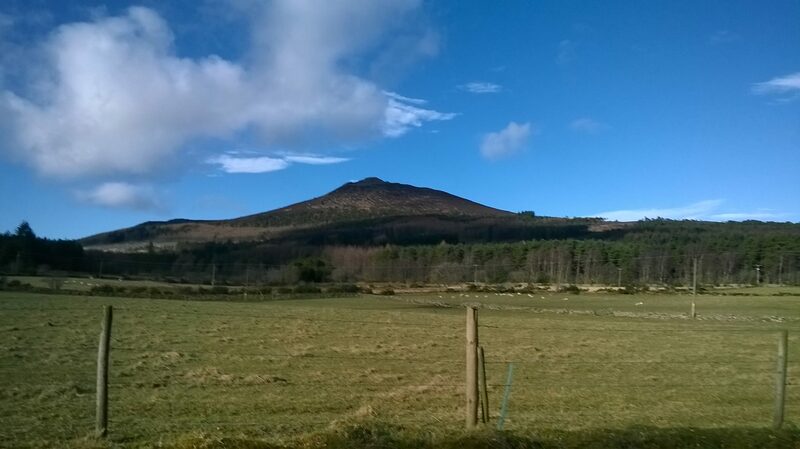 On Sunday we headed to Bennachie to do some hillwork. 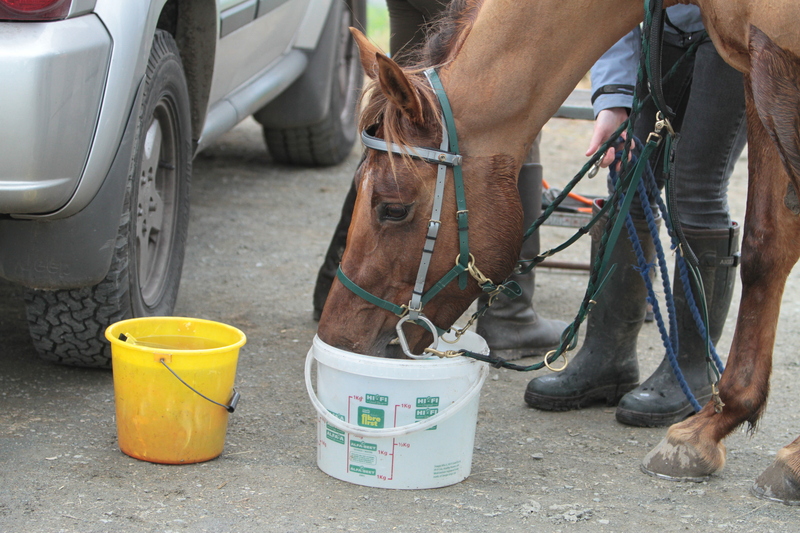 We met local endurance friends there – Gemma Cooper and her pony Morgan. 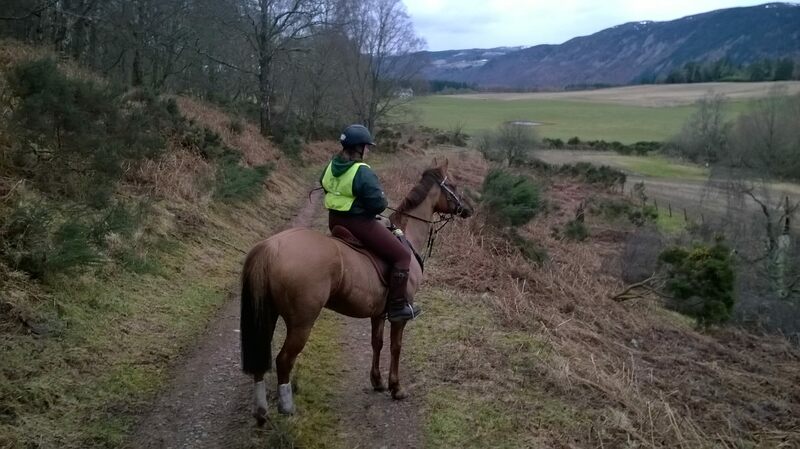 We had a lovely ride showing Gemma some loops she could do in future herself and got Spangle and Morgan working on the hills. 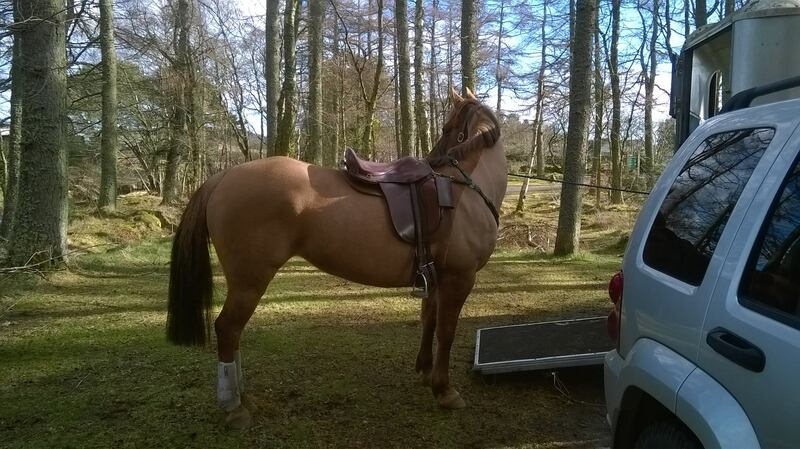 Our workout can be found on Endomondo – we had a super day out and Spangle went really well. A week past Saturday (21/02/14) Spangle and I set off to the Black Isle to stay over with the More Family – I met Helen when I went to a Scottish Team Training Day in 2004 – we forged a friendship, that was really cemented after both competing on the Scottish Team that year at the Red Dragon Festival of Endurance in Wales – not only did that experience in Wales see amazing lasting friendships made but also really gave me my drive and ambition to go further with Endurance. 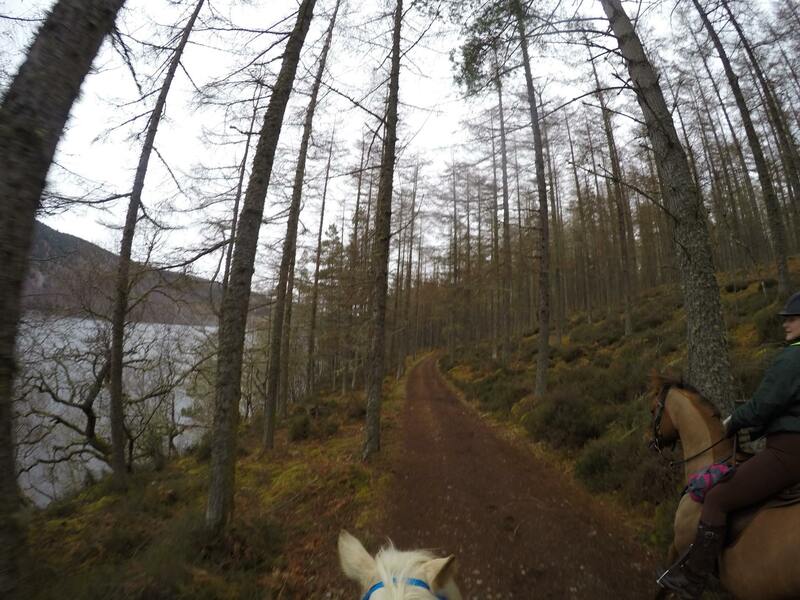 Helen and I went a nice leg stretch (Endomondo route) with the horses on Saturday afternoon and then on Sunday (22/02/14) we did the 16km Training Ride at Dores, on the shores of Loch Ness. 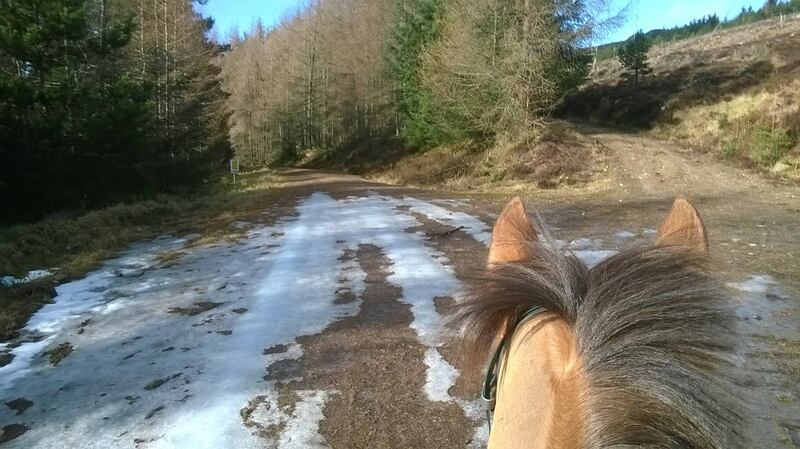 The tracks were great and offered many canter opportunities. The weather was kind whilst we rode and it gave Spangle and I a practice run at an event again – albeit a pleasure ride – we still have to have paperwork in order and with staying overnight the planning and preparation is greater – after a winter break getting back into the swing of things can be a bit tricky! We tracked the ride on Endomondo for those who wish to see where we were and what we were up to! The views on the ride were great 🙂 Thank you Lianne and Carol for the pics! Taking a step into a new world – and finding my feet blogging! 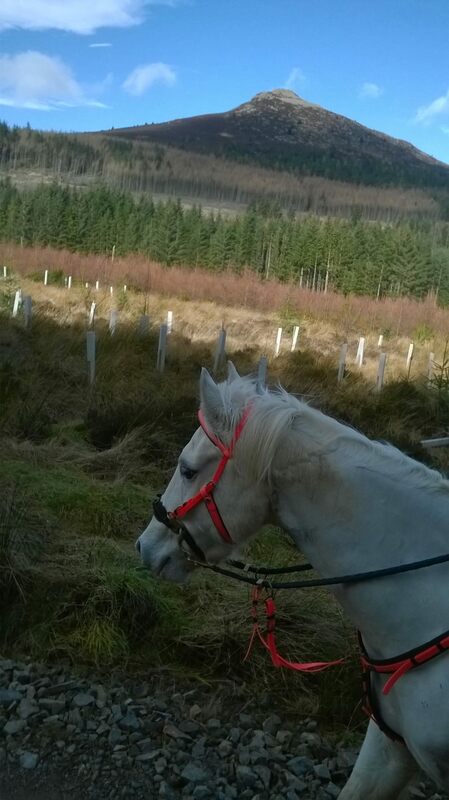 Test blog – Spangle having a drink after finishing the Red Dragon 2 day 120km ride – Oct 2014.